Good news: the American Girl Gift Guide is out, so parents and grandparents across the country can navigate the bewildering array of possibilities for holiday presents for their little angels. The online gift guide is a great way to find that perfect present! You can search for gifts by age or by price (tip for people on a budget: there are tons of great ideas for under $25!). You can check out the top-rated customer items and award-winning products. You can even have your daughter create a wish list and gift registry, and share it with family and friends. All of the historical dolls, from Kaya to Julie to the latest, Cecile and Marie-Grace, are great role models for your daughter. They're beautiful to look at, fun to play with, and interesting to read about -- you can't go wrong with any of them! Speaking of Marie-Grace and Cecile, American Girl is offering 25% off any Marie-Grace or Cecile product until November 13. I've never heard of a new American Girl doll being on sale before, so this is an incredible deal! 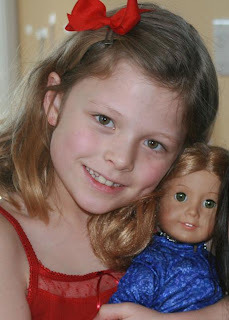 If either of these dolls is on your daughter's wish list, get them NOW. The holiday outfits for dolls are so pretty, it almost doesn't make sense to wait until Hannukah or Christmas to give them to your daughter. After all, a doll has to have something to wear to those holiday parties and Nutcracker shows, right? 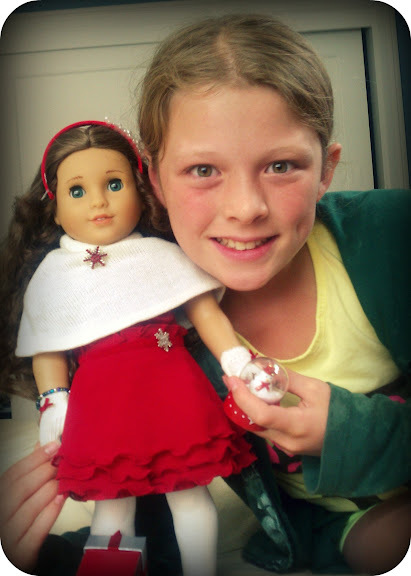 For this photo, The Pea dressed Marie-Grace up in the Merry & Bright outfit and accessories that American Girl sent us. She's hosting a holiday cookie swap party for her friends and their American Girl dolls in early December, and this is the natural choice of outfit for her doll. It's so pretty and festive, and the accessories set (capelet, mittens and snowglobe in a gift box) set it off perfectly. I'll post more photos of the dress and accessories after The Pea hosts her party -- but for now, just know that this one is a must-have! There is just something so special to a little girl about being able to dress like her doll. A couple of years ago I bought matching American Girl satin pajamas for The Pea and her American Girl doll for Christmas. I can't find a photo of them in their matching outfits, but here is a photo I took of her that Christmas day. The Pea's Just Like Me doll is wearing the pajamas, and The Pea's pajamas look just like that: oriental style in blue satin. She wore those pj's until they literally wore down! 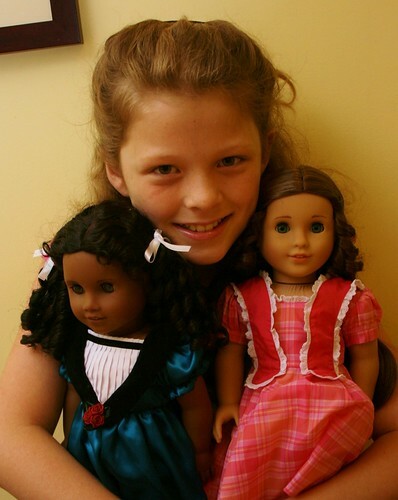 Disclosure: I product samples from American Girl. The views and opinions expressed here are my own. Gift Ideas For Girl it. Thanks you.